There was a paralyzed man. What did it mean to be paralyzed in Jesus’ day? To have a condition like being paralyzed meant that you or your parents had committed some grave sin, and this was the punishment for it. Today we obviously know that there are many reasons one can be paralyzed, but back then it was a pretty simple explanation. The Jews of that time took sin very seriously. If you had such a condition, it meant that you had committed some grave sin, meaning that you weren’t “holy”, as all Jews were called to be. The Jews were called to be set apart as a holy people. If you had a permanent mark of sin such as being paralyzed, it meant that you had to be separated from this holy people. And so the result was social isolation. Today we have many labels to separate people, labels that say “you don’t belong to us”. Some of these labels include “terrorist”, “Muslim”, “immigrant” or more accurately, “illegal migrant”, etc. We human beings always create labels to distinguish who belongs and who doesn’t. Among people your age, other labels might be “weird”, “awkward”, “stuck up”, and many others. What is the result of this labelling? The result is that people are isolated. And being isolated is one of the worst things that can happen to people, because we are meant to live together in community – that is how God created us. When we are isolated, we are often helpless. That was the case with this paralyzed man. He could not help himself. Physically, he could not move himself without help. Socially he was isolated too. When we are isolated, we often withdraw into ourselves and contain all of our worries inside. It becomes too unbearable, so we distract ourselves from our condition with watching shows or playing video games. This man needed a community to bring about healing. There are 2 parties at play here: his friends and Jesus. His friends were trying to bring him in and lay him before Jesus. But there was no way in. There were obstacles and barriers. But you know what? They didn’t let them stop them. They found another way to bring him before Jesus. What amazing love and dedication of his friends! It was this love of the friends that moved Jesus to heal the man: “When he saw their faith”. 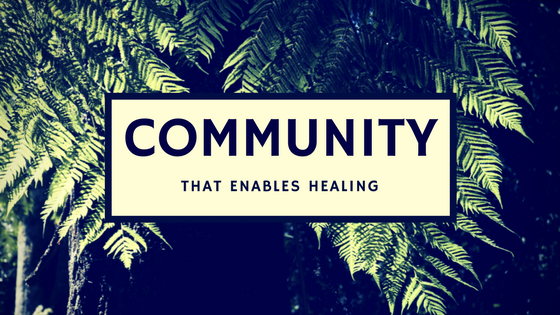 The lesson here is that a community brings us before God, and then God provides the healing. That is so beautiful, and I think that’s the way God intended for things to be. When we love one another and support one another, it opens our hearts and prepares us to receive healing from God. This passage shows us that we need both: we need a community that will give us support, that loves us in our vulnerability, and brings us before God. Then, God heals us from our brokenness. So that’s the first lesson: that we need a community that will be with us and bring us before God, so that God can heal us. The second lesson is what our role in life is, once we’ve had our own encounter with God. When we have received our own healing from God and love from a community, we are called to also go out and love and be a community for others. Everywhere around us, there are people who are lonely, isolated and broken. It’s everywhere. This is the world that God cries for. It’s the world for whom God’s heart is broken. God calls us to love with the kind of commitment and dedication shown by the paralyzed man’s friends. When we love with that kind of determination, people’s hearts will become slowly more open to receive God’s healing. In the end, only God can truly heal us – that’s not our role, to be the healers. But our role is to love and support so that they can be ready for God’s healing. Isn’t that wonderful good news? The good news is that we have such a community in the church. This is why we pray together. We share our vulnerabilities with each other and build trust and support among one another. Then we bring these vulnerabilities before God, who is the one that provides, healing, comfort and peace of mind. This is why we pray. And when we ourselves feel God’s presence in our lives and God’s healing, we are then called to go into the world around us and love those around us. We are called not just to our comfort zones and comfortable friends, but to reach out to those who are lonely, isolated and broken. This is our calling as God’s children. What a wonderful way to live life! So during this Thanksgiving Weekend, let us be so thankful for this community we have here, where we can laugh together, share what’s on our hearts, and cry and pray together. Through this community, may God heal us from our brokenness, so that we can then go out and be a community for those around us.